This morning a coworker, Dusty, brought in some donuts for breakfast. Dang it, Dusty! Needless to say it was hard to resist the beautifully sugar glazed gems. I caved and had one and a half. I took two, one plain and one chocolate glazed. A weight loss book I’ve been reading said that the first two bites of any food is the tastiest, so if you must have a food that’s not good for you just eat two bites and get rid of the rest. So, I took my two bites of my chocolate donut. Unfortunately, my two bites ended up being 1/2 of the donut! 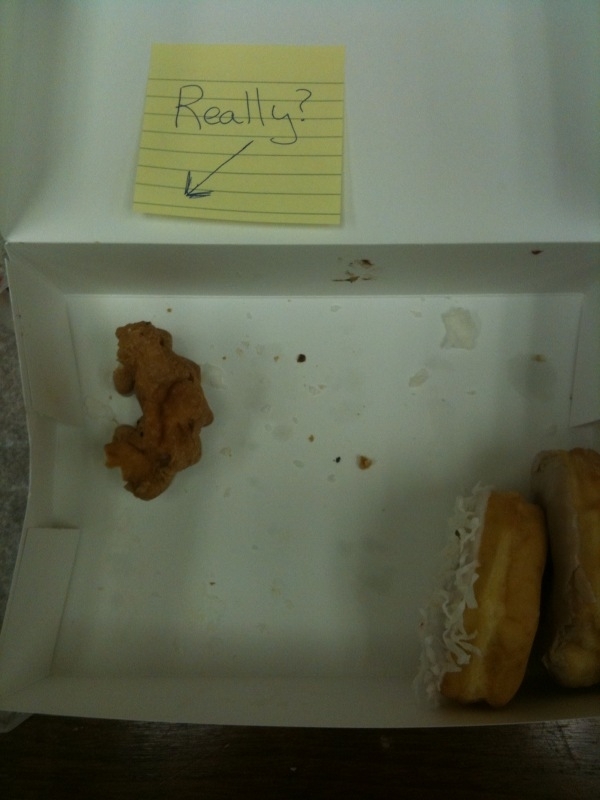 lol…I threw the rest away then later caved in and ate the plain donut. I guess someone else in the building decided they wanted to watch their weight so they only took 1/2 of the donut. Yes, they literally tore the donut in half and left the other half in the box for someone else. Who? I dunno. I’m not quite sure who would come along and pick up the other half and pop it in their mouth. I guess I’m not the only one that feels this way because someone put a sticky note that was meant to admonish the guilty person. This entry was posted in Food Faux Pas and tagged oops on December 31, 2009 by Tammy.